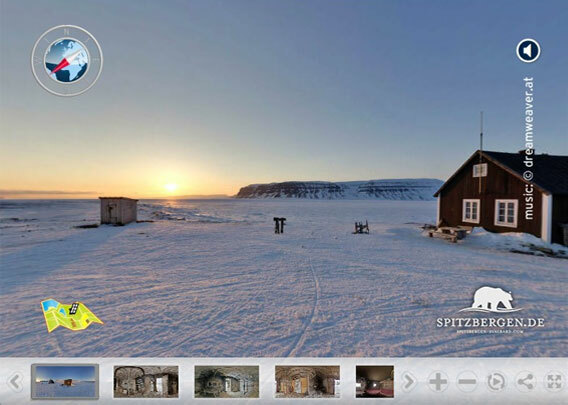 Once you have entered the virtual tour, you can either use the map in the lower left corner to navigate, or the bar at the bottom, or click on symbols within the panos to enter the next one (only while the next location is visible, not always available). Or you can just let it play and it will automatically switch to the next pano after one turnaround. You can switch the sound off (upper right corner) if you wish, same with the explanatory text. You can also view this virtual tour on iPads and other tablets if they are powerful enough and have an up-to-date systems software. On desktop systems, you can use both HTML5 or Flash. 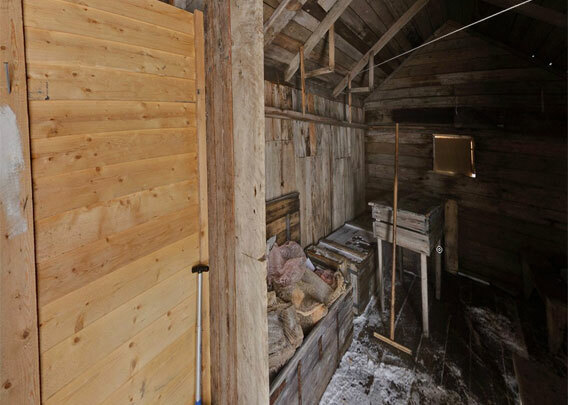 „Villa“ Fredheim is a trapper hut that belonged to the famous Norwegian trapper Hilmar Nøis. Hilmar built Fredheim in 1924 and lived there for most of the time until 1963. 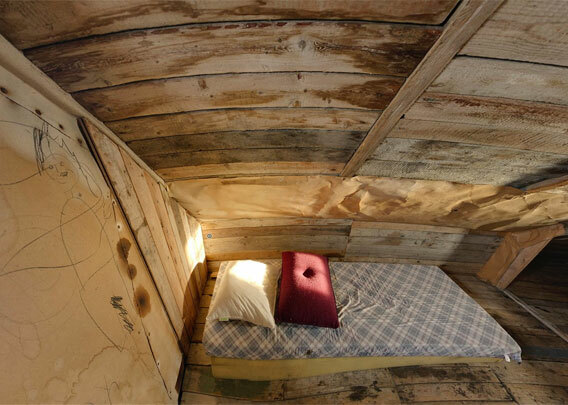 During these years, he turned Fredheim from a primitive hut into a comfortable, cosy home. 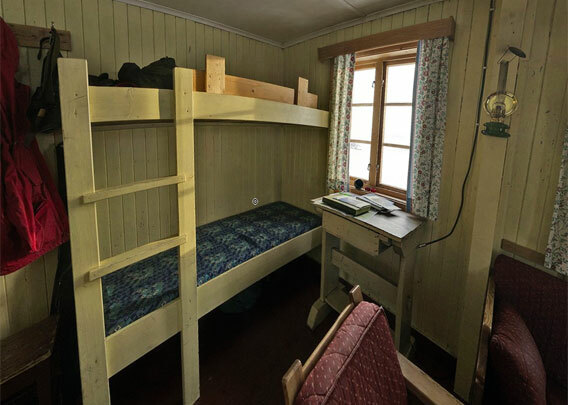 And indeed, Villa Fredheim is spacious, if not luxurious, compared to most other trapper huts in Spitsbergen. It has even got two floors! 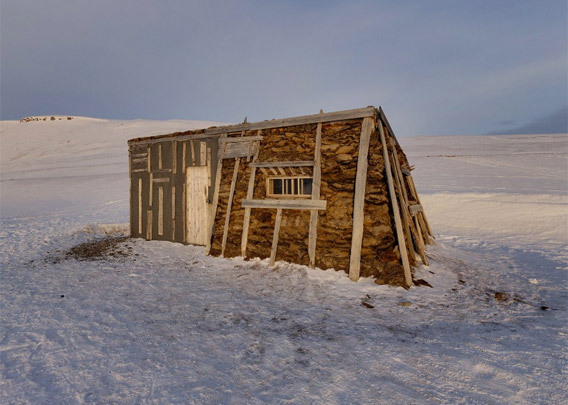 Most other trappers huts in Spitsbergen are certainly much smaller and less famous than the legendary Villa Fredheim. Next to the main hut Villa Fredheim, there are two other, smaller huts. „Danielsbu“ (Daniel’s hut) is the oldest one, also called „Gammelhytta“ (old hut). Closer to the main hut, there is also „Nødhytta“ (emergency hut), serving as storage place and having a heatable room in case of emergency. In addition, there is even a small toilet house, in safe distance from the other buildings. The site had been used by Pomors (Russian hunters) before the Norwegian trappers started coming to Spitsbergen, mainly from the 1890s. There were foundations of a Pomor hut visible on the shore shortly west of Fredheim, but the site was destroyed by coastal erosion, which is also threatening Fredheim. In 2015, the 3 huts were moved up to a higher, safer terrace, as they were threatened by coastal erosion in their original position. Gammelhytta is the oldest building at Fredheim. It was built in 1902 by Lars Gunnarsen Nisja, who wintered there subsequently. In 1911, it was overtaken by Daniel Nøis, who was Hilmar’s uncle. Daniel Nøis made improvements on the hut and it is accordingly often called Danielsbu. At times, most male members of the Nøis family from Vesterålen was involved in hunting and fishing in the Barents Sea. 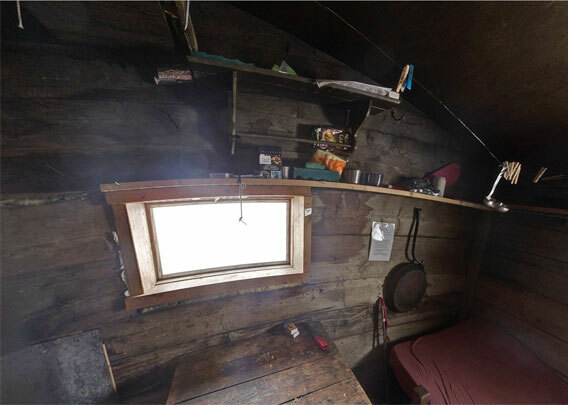 Daniel Nøis built this hut for a wintering in 1911/12. 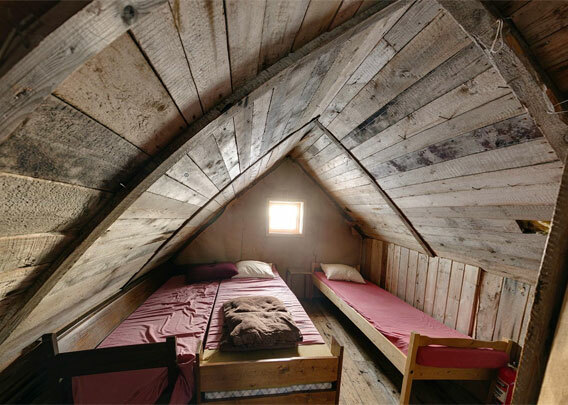 It is one of the best preserved examples in Spitsbergen for a trappers hut built in a traditional style, with outer walls insulated with peat and moss and a roof covered with the bark of birch trees. 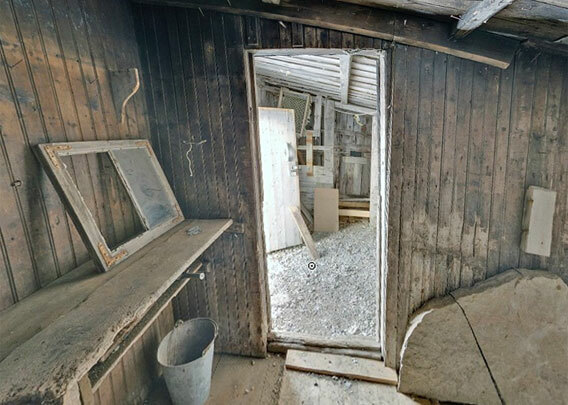 Instead of a wooden floor, there is a layer of gravel covering the ground in the first of the hut’s two rooms. Hilmar Nøis used to live with his first wife Ellen Dorthe (born Johansen) in Danielsbu for some time. In autumn 1913, the couple got married in Norway, and a year later their daugher Embjørg was born. Shortly before birth, Hilmar, however, went to Spitsbergen for a wintering. 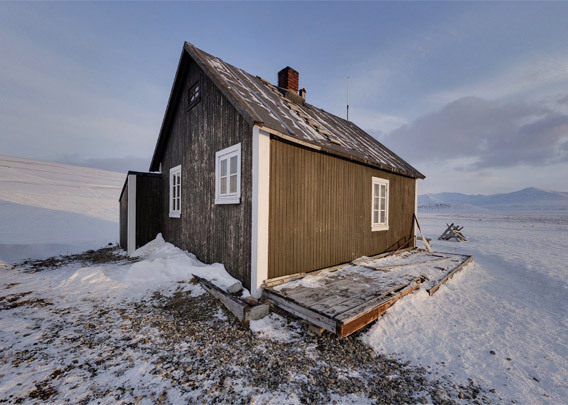 For several years, the couple lived separate lives over most of the time, Ellen Dorthe in Norway and Hilmar in Spitsbergen, and they saw each other only during a short time in summer, until she joined him for her first wintering in Spitsbergen in 1921. In Danielsbu, Ellen gave birth to their second child on 11 June, 1922, a boy called Johannes Normann Kaps Nøis. Hilmar had gone to Longyearbyen to get the doctor, but they were too late: meanwhile, Ellen had given birth all on her own, without any help or support, in a primitive hut, alone in the arctic. This extreme experience was more than Ellen could handle, but she nevertheless returned for another winter together with Hilmar in Fredheim, but she left on the first possible occasion. The winter, especially the many days she had been alone in the hut, had been too much; it is said that Ellen never got entirely rid of the mental stress she had suffered during those two arctic winters. She got divorced from Hilmar soon after return. Her son Johannes Kap however wintered several times together with his father and worked in the coal mines in Spitsbergen. Nødhytta was built by Hilmar Nøis as storage and spare building in case of emergencies and has appearently never been used for any purpose beyond this. It is the only one of the three buildings at Fredheim which is not locked now. 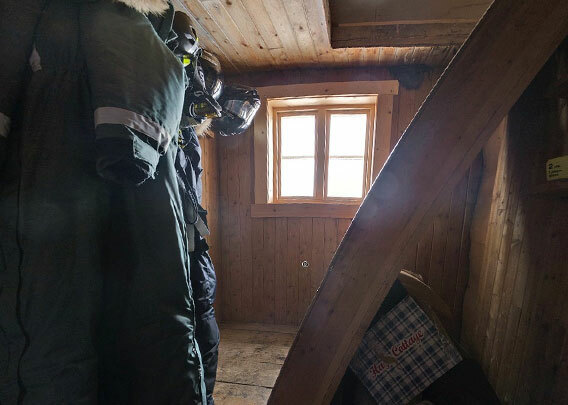 As the name suggests, „Nødhytta“ is an emergeny hut, where Hilmar would have found shelter in case of a fire of his main hut. This, however, never happened. The first room is unheated and served mainly as workshop and storage. The second room of Fredheim’s Nødhytta is small and it has got a nice wood-burning stove, so it is easy to heat it up quickly. Villa Fredheim is the largest and most famous of the 3 buildings at Fredheim. 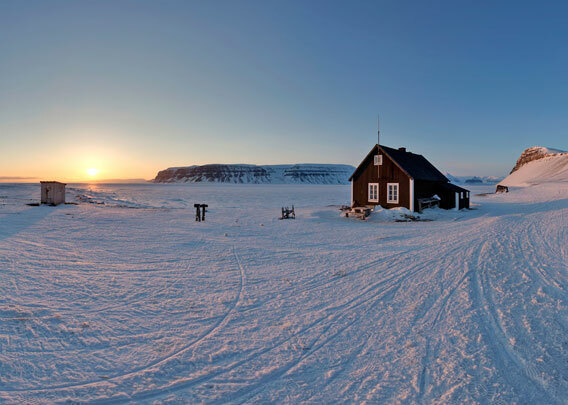 It is one of the most beautiful and well-known trapper huts in Spitsbergen. Amongst others, it had an outside veranda on the side facing Tempelfjord. And there was even a little garden! Probably not with crane’s bill and tulips, but with local flowers such as saxifraga and Svalbard poppy. Every reasonable trapper hut had a small entrance room to keep wind and snow from blowing into the hut when the outer door was opened. This is obviously where Hilmar Nøis and his subsequent wives Ellen Dorthe and Helfrid prepared their food. Guests were usually welcomed with fresh waffles or cake and glowing-hot coffee and they were always served the best Villa Fredheim had to offer. Tthat was certainly above local standards! 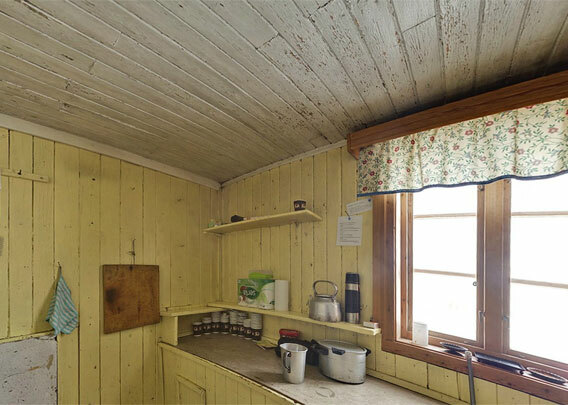 In Hilmar’s days, a wood-burning stove was used for cooking; today, there is a gas cooker, as is usual in huts in Spitsbergen which are still being used. The first part of the living room, near the door to the kitchen. 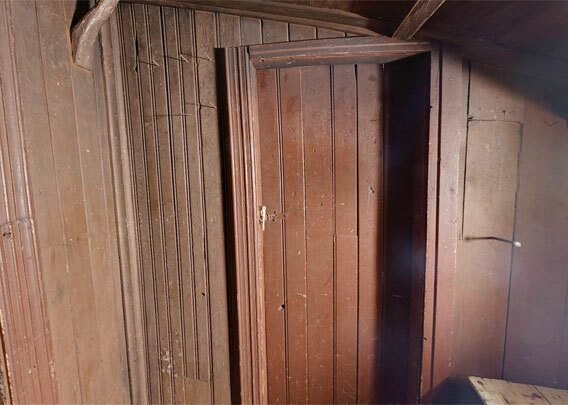 This used to be a separate, unheated room in the early days of Villa Fredheim. 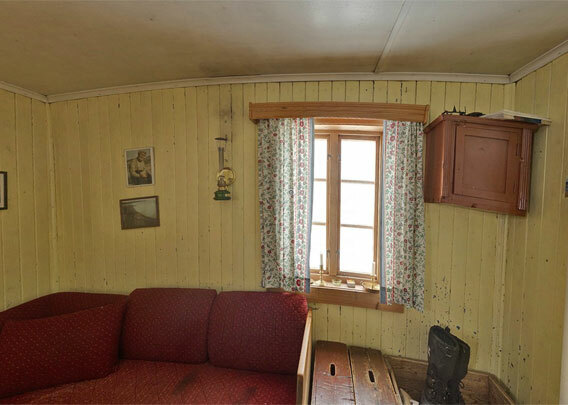 It was mostly the influence of Hilmar’s second wife Helfrid, starting in 1937, that made sure the place was gradually becoming more and more cosy, removing the separating wall to make this once separate room part of a bigger living room. Soon there would be a new stove and even gardins and carpets. Hilmar and Helfrid met each others on a Hurtigruten ship (Norwegian coastal steamers) and were married on 22 August 1937 in Fredheim by the Sysselmannen. Story has it that Helfrid was informed about this arrangement one day in advance. Hilmar obviously had known about this a bit earlier, as he had even arranged wedding rings. The inner part of the room is the original smaller living room. Hilmar and Helfrid lived most of their time here until they moved to Norway for good in the 1960s. Then, Hilmar could look back to an amazing 38 winterings in Spitsbergen! He died 1975 at the age of 84. Helfrid even got 96 years old, she died 1996 in Bodø. 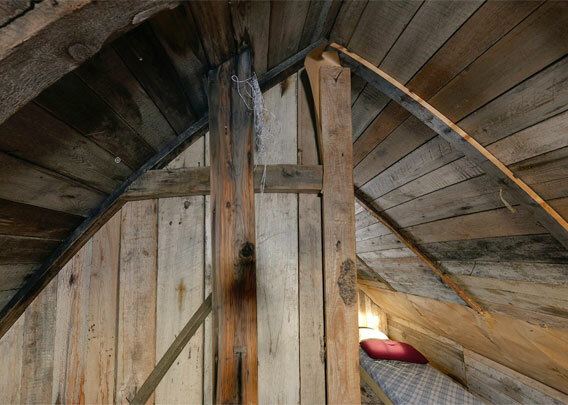 „Villa Fredheim” deserves the title villa amongst others because the house has got two floors, something that was very uncommon for a trapper’s hut. The lower end of the stairs was and still is being used for storage. The first part of the top floor. Apart from a small lumber-room, it is all one room, a bit separated in two parts by the chimney. 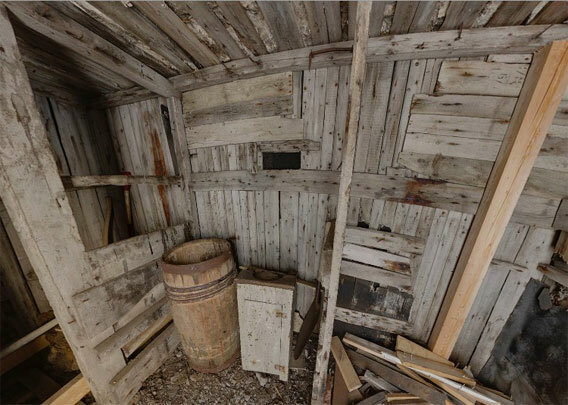 In the old years, tools and provisions were stored here. Today, there are matrasses for guests. The middle part of the top floor. It is quite obvious what Fredheim is being used for today: it is no longer the lonely home of a hunter and his wife. Today, Fredheim is mostly empty, only used occasionally during weekends by a few privileged people and their friends. The far part of the top floor. Against old tradition in the arctic, there is now a lock on the door and the official seal of the Sysselmannen på Svalbard, the Norwegian governor. 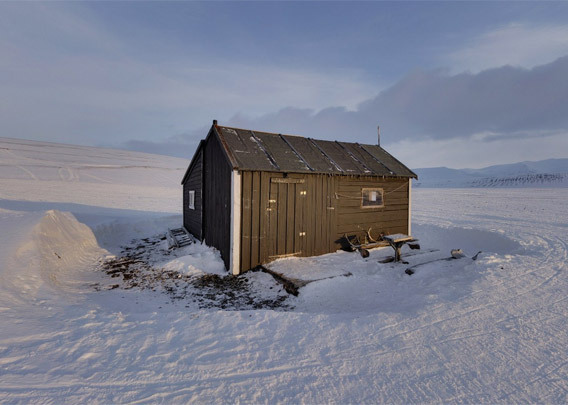 Many huts in Spitsbergen have been closed by the local authorities out of fear for damage. But how many have decayed and fallen apart because they were not used anymore and accordingly never heated and repaired? A lot, and it’s getting more every year. The authorities have only limited resources and cannot take care of all of these old, beautiful huts. There are individuals and clubs who have got resources, motivation and competence to take care of these huts, but usually there is no opportunity. 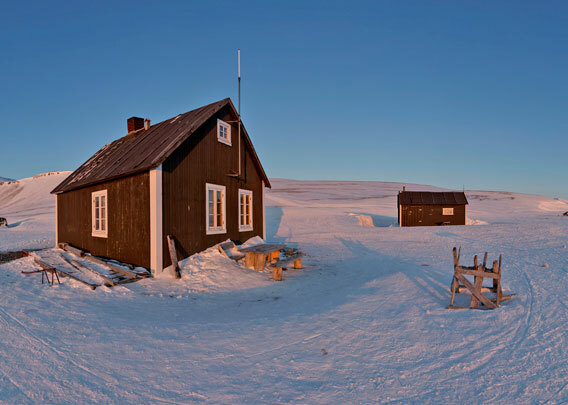 In the case of Fredheim, the most prominent, it is given at Christmas and Eastern to locals from Longyearbyen who can apply for it, and during two weekends in late March and April, there is an open day where everybody can visit to have a look inside. The fact that the governor’s staff are able to use Fredheim for private purposes is controversial, to put it mildly, and it is doubtful if Hilmar Nøis would have agreed to this arrangement. He left it „to the people of Spitsbergen“ and not „to the Sysselmannen“. Nevertheless I want to thank those friendly Sysselmannen staff who gave me the opportunity on 29 March 2014 to spend some time at the end of an open day, once everybody else had left, and shoot these panoramas! Now it is possible to visit Fredheim on the internet.